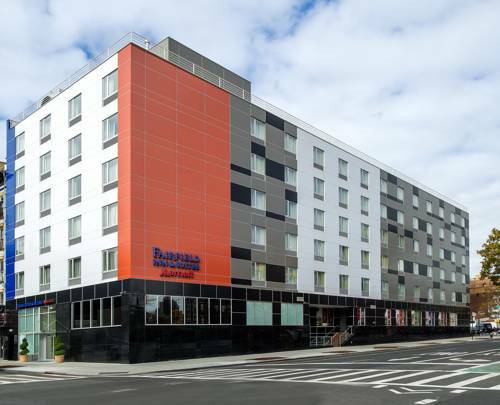 Begin your New York City adventure at the Fairfield Inn & Suites New York Manhattan/Downtown East. Our new, modern hotel is located in the city's Lower East Side, convenient to Chinatown and Little Italy. You'll find it easy to explore all of Lower Manhattan from our hotel and visit downtown attractions, like Wall Street, NYSE, and the 9/11 Memorial. Our stylish rooms are decorated in bold colors and filled with modern amenities like complimentary Wi-Fi Internet, plush bedding, and Paul Mitchell bath accessories. While the nearby dining options are limitless, we invite you to begin each morning at the hotel with a fresh, hot complimentary breakfast buffet. Be sure to hit our modern fitness center for a workout while you're here in Downtown Manhattan, or stop by our 24-hour Corner Market for a last-minute snack or beverage. Offering an accessible, sophisticated option from which to explore the world's greatest city, the Fairfield Inn & Suites New York Manhattan/Downtown looks forward to hosting you.